The poorest districts in one of the most poor countries of the world have suggested ways to mitigate the problems they face due to climate change. 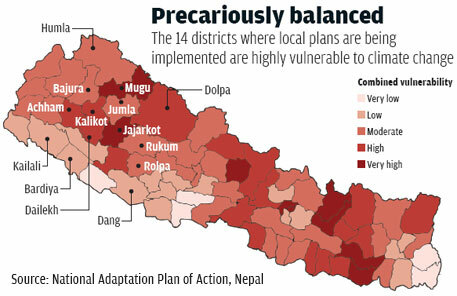 Nepal, which is going through a political transition and drafting a Constitution, has made the most vulnerable sections of its population a part of climate change adaptation planning. High poverty rates and fragile ecology make Nepal extremely susceptible to climate change impacts. As per assessments done by the government, the mid-western and far-western regions, where small-scale agriculture is the main occupation, are highly prone to drought, landslides and changing rain patterns (see ‘Precariously balanced’). Compared to the rest of the country, the adaptation capability of these regions is also quite low. But despite the turmoil it is going through, Nepal became the first country in the world to develop a bottom-to-top planning approach when it announced the National Framework on Local Adaption Plans for Action in November 2011. The implementation started in 2013 and is to be completed by the end of 2015. Local Adaptation Plans of Action, or LAPA, identify local needs, options and priorities, and incorporate them in national policy. The programme was conceptualised to ensure better implementation of Nepal’s National Adaptation Programme of Action (NAPA), which was launched in September 2010. Local plansare prepared with inputs from the village/municipality level, using community wisdom.“They are the wish documents of communities,” says Som Lal Subedi, secretary, Ministry of Federal Affairs and Local Development (MoFALD), Nepal. For instance, drought-prone village Vishala in Dailekh district wanted the authorities to provide drought-tolerant seed varieties and construct a pond. These suggestions were accepted. A total of 70 local plans were prepared for 69 villages development committees (VDCs) and one municipality in 14 of Nepal’s poorest and vulnerable districts for implementation in 2013-14. The plan included 796 types of climate change adaptation activities (see ‘Key solutions’). About 45 per cent of LAPA activities have been implemented till February 2015, according to government sources. As far as budgetary allocations are concerned, they are being made as per NAPA guidelines which make it mandatory to disburse at least 80 per cent of the budget directly for implementation of the identified adaptation action at the local level. Of the total approved budget of 54 crore Nepali rupees (NPR), NPR 49 crore were allocated in 2013-14 (US $1 equals NPR 100.13). For 2014-15, of the total allocation of NPR 73 crore, NPR 57 crore has been granted. The process of formulating LAPA was not easy. 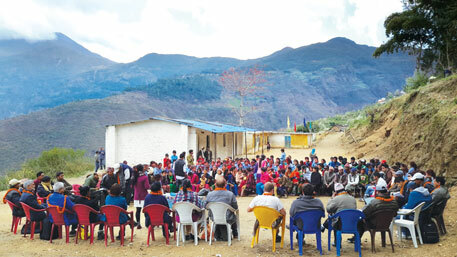 “We faced a lot challenges in sensitising the community about the problems their region was facing and getting their inputs on the possible solutions,” says Subedi. The government needed to figure out adaptation programmes suited to different regions of the country, which is marked by undulating terrain, fragile landforms and unevenly distributed resources. Community involvement was also necessary to ensure that they support the plan. The government took the help of NGOs to reach out to communities and the preparation process was overseen by Nepal’s environment ministry. UK-based consulting firm HTSPE Ltd assisted in formulating local adaptation plans. The preparation of plans started in April 2012 and was completed the same year in September. The implementation of LAPA was overseen by the Ministry of Science, Technology and Environment in co-ordination with MoFALD. A plethora of government and non-government bodies were also involved. These included Nepal’s Climate Change Council, Ministry of Finance, district administrations, community-based organisations, NGOs and indigenous groups. District development committees and VDCs were the key implementation agencies at the local level. The United Nations Development Programme (UNDP) provided technical assistance to the programme. It is a little difficult to assess the success of LAPA, say experts. “Different countries have different circumstances, policies, and governance structures and it seems that local plans have a great potential to succeed. However, in Nepal it is still too early to say because result will take some time to be visible,” says Shanti Karanjit, climate change policy analyst, UNDP Nepal. However, it is clear that the programme has made communities an important stakeholder in the planning process rather than a spectator. “The Local Adaptation Plans of Action being developed and implemented in Nepal are an excellent innovation that other countries should follow,” says Saleemul Huq, director, International Centre for Climate Change and Development. Such initiatives create awareness in the community, and help in bringing climate change adaptation mechanisms to the mainstream.